When did you get started running: I started running regularly in my mid-20’s when I returned to the States after my service in the Peace Corps. Our group was evacuated due to safety reasons, and running was a way I could process my mixed emotions about the experience and reevaluate my next steps (and I didn’t want to pay for a gym membership). I loved the personal and physical strength I felt I was developing in the process, and ran my first half marathon a couple of years later! Have you taken a break from running: I’ve had a couple of minor injuries that required rest and healing, but that was about it! Coach or training group: D.C. Run Crew! The hardest race you’ve ever run: My first marathon! Baltimore was hillier than I anticipated and I could barely feel my legs the last six miles, but I ran that whole course and felt like a champion at the finish line. 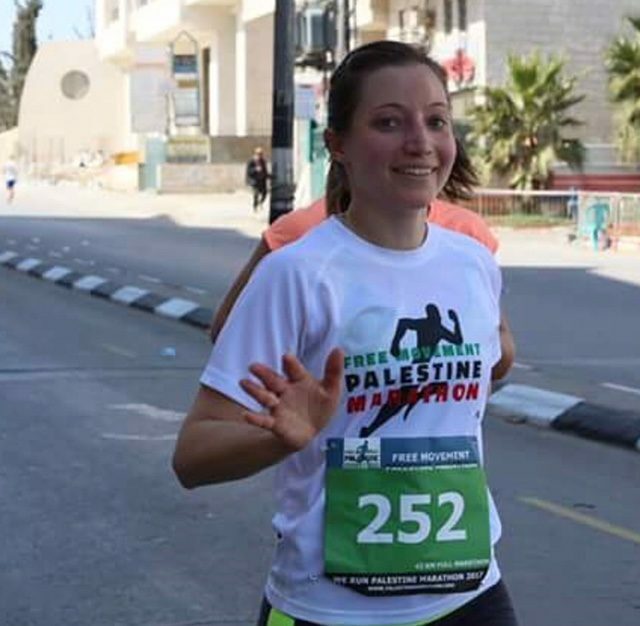 Most adventurous decision you’ve made with your running: I found the Palestine Marathon in a news article a few years ago and knew I had to run it. I’ve had a long-standing interest in the region and studied the human rights issues there while earning my MA, and figured this was finally my chance to travel to Israel and Palestine and defend the right to movement – a basic right that Palestinians lack on a daily basis there. I got connected a few months later with a friend leading a group to explore the region, meet Israelis and Palestinians doing peacemaking work, and participate in the marathon. Running in that race was challenging, both emotionally and physically. The course in Bethlehem runs along the 26 foot-high separation wall, through the 71 year-old Palestinian Aida refugee camp, and up and down the hills of Bethlehem. It is an opportunity to run in solidarity with the Palestinian community in an act of nonviolent resistance to the occupation, and to briefly begin to understand daily life there. It has brought be back every year since my first race in 2016, and I love every step of it – even the hill up to the finish line in front of the Church of the Nativity. Running mentors: Any woman out there running to meet their next goal. My best race was: This year’s Palestine Half Marathon! I had two incredible teammates that were committed to running every step of the way together and encourage one another up every hill. We crushed it, and I got my best time in that race! Favorite local race: I think the Cherry Blossom Ten Mile may be my new favorite! The Washington, D.C. Ragnar was pretty great, too. Goals: Run a new race every year. Your advice for a new runner: Register for a race to have a goal to works towards, and get a friend to join you in writing a new story together! Why is the D.C. area a great place to be a runner: There is a strong running community here, and I love the friends I have met in our shared journey.